In early November, during the Carolina Farm Stewardship conference I went on the afternoon bus tour to see 10 high tunnels and how they’re used for season extension, irrigation, disease control, pest protection, and trellising. Red Hawk Farm grows salads and greens year-round in six high tunnels (more under construction! ), and sells primarily to local grocery stores and restaurants. Funny Girl Farm grows produce year-round for its popular farmstand and CSA, with four high tunnels and a greenhouse.They were focusing on the sweet potato harvest outdoors when we visited. Red Hawk Farm hoophouse densely planted with multileaf lettuces. At Red Hawk Farm I was astounded to see this whole hoophouse planted wall-to-wall with multileaf lettuces. No aisles! The farmer Brett Evans plans to harvest with a walk-behind motorized salad harvester machine that makes a 4 ft wide cut. Then he’ll leave the lettuces to regrow. He uses the paperpot transplanter which I mentioned last week. Here are the starts growing in their propagation house. Lettuce starts in paperpots at Red Hawk Farm. Early November pepper harvest at Red Hawk Farm. Another interesting feature was the opening roof vent, which I had not seen in operation on a hoophouse before. Opening roof vent on a hoophouse at Red Hawk Farm. And this past week, I went to Potomac Vegetable Farms in northern Virginia for a talk with Future Harvest CASA members, and a tour of the hoophouses used there led by farmer Zach Lester. I was interested in seeing the success he is having with caterpillar tunnels. These are smaller tunnels with a single layer of plastic, held in place by ropes, as you see in the photo below. They can be temporary or short-term, and Zach showed us one which is a “swing house” with two sites side by side, sharing one row of ground posts, and having just one row to move each time. Another way to deal with crop rotations and reduce the chances of pests and diseases! Caterpillar tunnel at Potomac Vegetable Farms. At the ends, the plastic is gathered up and tied to well-anchored stakes, as you can see here. How the ends of caterpillar tunnels are gathered and fastened to stakes. Zach got these frames custom made by Nolts. They have taller sidewalls than many models. He is also a firm believer in having a ridgepole in caterpillar tunnels, to reduce the likelihood of collapse with snow or high winds. As you can see here, they had some snow already. Potomac Vegetable Farms caterpillar tunnel showing rolled up side. At both these farms, I learned the technique of laying landscape fabric along the side walls to reduce weed growth. You can burn holes in the landscape fabric where the ground posts go through, and it will keep the weeds away for a long time. I wish I’d known that technique when we put up our hoophouse. We have to hand weed, and in some places we have wiregrass (Bermuda grass) which has grown under the baseboards and even between the boards where there are joins. Lastly, I have of course visited our own hoophouse at Twin Oaks, and have written a post for Mother Earth News Organic Gardening on Dealing with Snow on Your Hoophouse. So if it’s snowing where you are, you can click on the link to read about that. I ran out of handouts, and I know some people want to view the slideshow again, to catch the bits they missed. Before next Tuesday, I’ll upload The Hoophouse in Fall and Winter as well. Maybe even later today, if I get my more urgent tasks done first. Sweet potato slips growing in our germination chamber. Meanwhile the March issue of Growing for Market magazine arrived, and I found a fascinating article about a new method of growing sweet potato slips, from Anthony Boutard and Caroline Boutard Hunt. They write first about “discovering” sweet potatoes and then deciding to grow them, ordering 20 varieties from the Sand Hill Preservation Center. Their propagation method involves cutting each slip into one-node pieces and growing a plant from each short length. This reduces the number of roots to set, which saves propagation space. The single-node cuttings are set in 50-cell plug flats, trimmed of their leaves and grown in the greenhouse for only two weeks before planting out in the field. This reduces the time caring for the young plants by a lot, which once again saves greenhouse space. They say “The resulting crop is better quality because all of the resulting tubers grow from a single node instead of several, concentrating the production. Better yet, there is absolutely no drawback to the technique, at least in our experience to date.” And then, this lovely sentence “Certainly no reason to keep it within the family.” I love the way small farmers share information and tips! Amusingly, they refer to the method I have written about as “traditional sweet potato slip production”! When I was starting out propagating our own, I followed advice to use cold frames, which clearly doesn’t work in Virginia in March and April. I couldn’t figure how those methods could produce enough slips in time unless a huge number of roots were used to start them. I found out that growers were actually using electrically heated beds. I tried a soil heating cable but it was nothing like warm enough. I searched for more advice and found the Southern Sustainable Agriculture Working Group the previous year had an Organic Farmer Network, who were exchanging tips. Someone, I think Ellen Polishuk of Potomac Vegetable Farms, answered others’ questions about growing sweet potato slips with something like “I just grow them in flats.” That was a lightbulb moment for me – I knew how to grow things in flats! It didn’t seem like it was the traditional method at that time, but it certainly worked, so I adopted it and spread the word. For this issue of Growing for Market, I wrote about West Indian Gherkins as a trouble-free alternative to regular pickling cucumbers. We’re growing them in our hoophouse this spring, on a trellis net. Andrew Meffert continues his series on greenhouse nightshade crops for colder climates. This month he provides part two of his detailed work on greenhouse peppers: Pruning and training for maximum production all season. Lynn Byczynski gives some leads on finding and enjoying farming podcasts, while we are sowing seeds, potting up or otherwise engaged in manual not-mentally-demanding work. Gretel Adams offers information about weed control in cut flower fields, and of course, it’s equally useful for vegetable fields! Crop planning to rotate crops with different growth habits and timing; neighboring up crops that will have similar cultivation requirements; using the most suitable tractor cultivation equipment; co-ordinating spacing of crops to fit the different equipment (including hands!) to be used for sowing and cultivating. It all adds up to efficient weed control, and maximizing yields from the space. 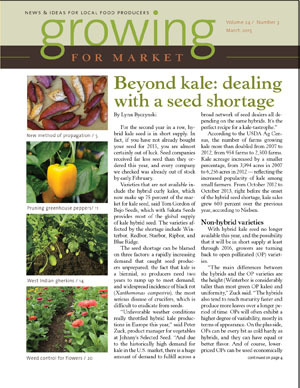 The lead article is by Lynn Byczynski, and provides a warning about a shortage of hybrid kale seed for the second year running. This has been caused by an increased demand for kale (yay! ), a widespread case of black rot disease (boo!) and the fact that the biennial nature of brassica seed production means it takes two years to ramp up seed production. There are some great new OP kales out there. 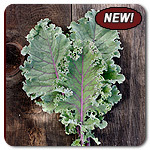 We have our eyes on Olympic kale, available from High Mowing Seeds.